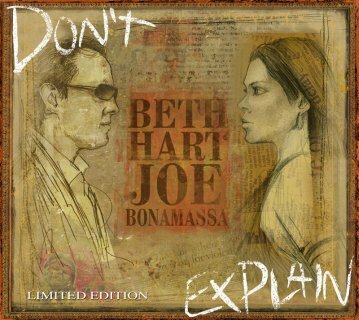 BETH HART/ JOE BONAMASSA - DON’T EXPLAIN VINYL (LP BLACK) | Online Shop | Wizard LTD. Album: "DON’T EXPLAIN VINYL (LP BLACK)"
Los Angeles-based singer-songwriter Beth Hart, known for her raw and powerful blues-rock sound, wraps her expressive vocals around classic soul covers on Don’t Explain, an album that grew out of her friendship with guitarist Joe Bonamassa. Produced by Kevin Shirley (Joe Bonamassa, Led Zeppelin, Black Crowes), the album features Hart’s scorching interpretations of ten songs, with Bonamassa on guitar and his ace band filling out the tracks. “Beth’s got a pretty heady voice, very reminiscent of Janis joplin,” says Shirley, who has produced Bonamassa’s last five albums. “She’s also got a lot of Etta James in her, but hadn’t really accessed it. With this material, there is a gentleness to the way she delivers the most heartfelt tunes that she hasn’t shown before. It’s very cool, she’s done a fantastic job. To back Hart up, Bonamassa assembled the ace band that was heard on his #1 Blues album The Ballad of John Henry (2009): Anton Fig (drums, percussion), Blondie Chaplin (guitar), and Carmine Rojas (bass), as well as Arlan Scheirbaum (keyboards). a lovely person.” Don’t Explain” explains it all.